IZOD Micro-sanded Golf Pants. Another great option for anybody looking to purchase a pair of trousers specifically for their Game’s of Golf. These come in at an amazing price when you consider the fact that not only were they micro-sanded (makes them a lot more comfortable) but they’re also jam-packed with other useful features and design tweaks. The two main features are clearly the Micro-Sanding which gives the pants a silk-like feel, making them extremely comfortable and lightweight. 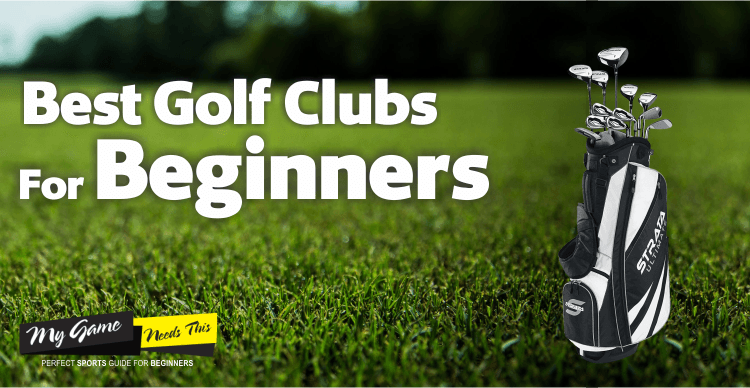 This is great for anybody who knows they like to spend a long period of time at the course! 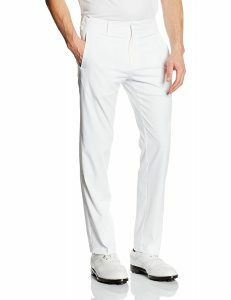 Again these golf pants have been constructed using 100% Polyester and come with a French Fly Zipper also. In this article, we will go over what we believe to be some of the good golf trousers currently available. Major brands such as Adidas and Under-Armour are all competing to get your purchase so make sure you’ve done your research before picking up a pair of pants! Price can range from around $30 all the way to $100. Designed to release heat and keep you cool. A wide range of colors and sizes. The first Pants on our list are brought to you by Adidas, these pants are some of the most popular on the market and a great option for anybody looking to keep their cool whilst playing a game. 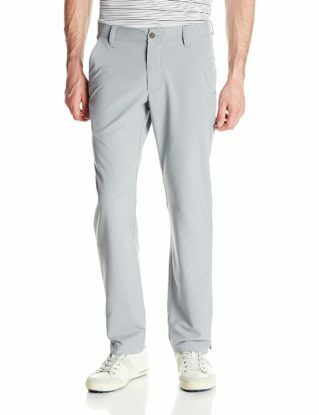 If you happen to play in a club which has banned Shorts then this pair of golf trousers could be the next main thing. They’ve been made from 100% Polyester and look amazing. The typical 3 stripes of Adidas can be found on the back although they aren’t as obvious as they are on most of their products. These pants easily stretch to fit your body and typical movements, however many customers have complained about them being a bit too tight. So if you’re a larger person you may want to get a slightly bigger size! If you know you have thick legs them ‘slim fit’ pants may not be ideal, although they should be fine for most people. Other than the fact that these are very nice pants their main attribute Is how quickly they release heat. You shouldn’t get too hot at any point throughout your Game and remain comfortable and calm at all times. Customers have loved their experience with these pants having rated it a 4.5 out of 5 stars on the Amazon Marketplace. This rating was earned through over 500 reviews which should give you confidence that this is a quality product. There are four pockets In total two on the front of the pants and two on the back, which gives you plants of space to carry any needed items. Micro Sanded for extra comfort. Cool FX means you should never get too hot. Could easily be worn for other events. Second on our list are the IZOD Micro-sanded Golf Pants. Another great fit for anybody looking to purchase a pair of trousers that come in at an amazing price when you consider the fact that not only were they micro-sanded (makes them a lot more comfortable) but they’re also jam-packed with other useful features and design tweaks. Micro-Sanding is a great feature which gives the pants a silk-like feel, making them extremely comfortable and lightweight. Manufactured using 100% Polyester and come with a French Fly Zipper, this pair of golf trouser might seem to feel uncomfortable if you spend a lot of time on the course. But thanks to the Cool FX feature which make sure you never get too hot or sweaty at any point throughout your session. 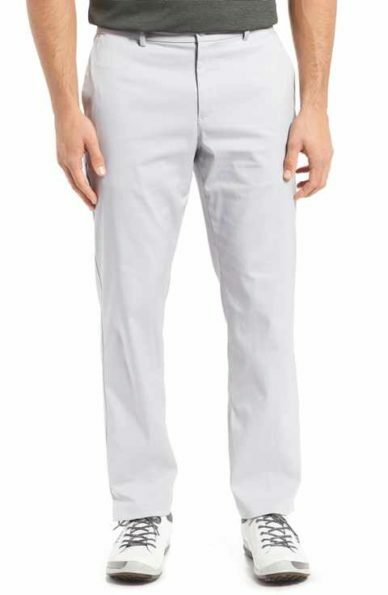 The IZOD Mens Classic Fit Golf Pants are one of the best pairs of golf pants available in the market today. Even if you get a bit wet or sweaty this technology will make sure the moisture is allowed to evaporate before it causes you any discomfort. When compared to the Adidas Men’s Golf Pants these are much larger and definitely aren’t a slim fit. In fact, we would say that if you are a skinny person you may want to order a size smaller with these pants! They are un-undoubtedly comfortable and will make you look professional thanks to the rubberized piping which ensures your shirt would never go un-tucked. 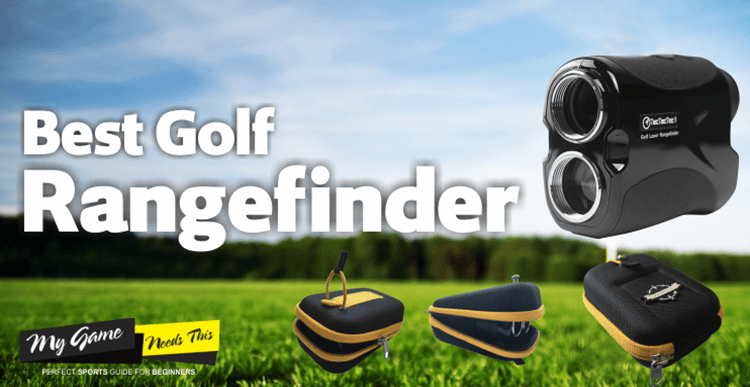 A great fit for golfers spending a lot of time playing golf. Customers have clearly loved these trousers giving them an incredible 4.3 out of 5 stars from nearly 700 reviews on the Amazon Marketplace. A great looking pair of trousers that can be worn not only for playing Golf but easily usable in everyday situations. The material used for these pants consists of 96% Polyester and 6% Spandex. Although 6% may not seem like a lot it will make a massive difference when making any quick movements! It also means should you put on a bit of weight they will stretch to fit you which will save you from having to purchase a new pair. 80% of customers found that these pants fit ‘As expected’ according to Amazon. A game of Golf will usually last quite a while and be played on a nice Sunny day. You don’t want to be sweaty or uncomfortable at any point taking a toll on your concentration. The Palm Springs Golf Trousers are really comfy with a Flat front, typical of most golf pants, making sure you’ll fit right in, and because of their lightweight material, you can enjoy your game without feeling hot or sweaty. 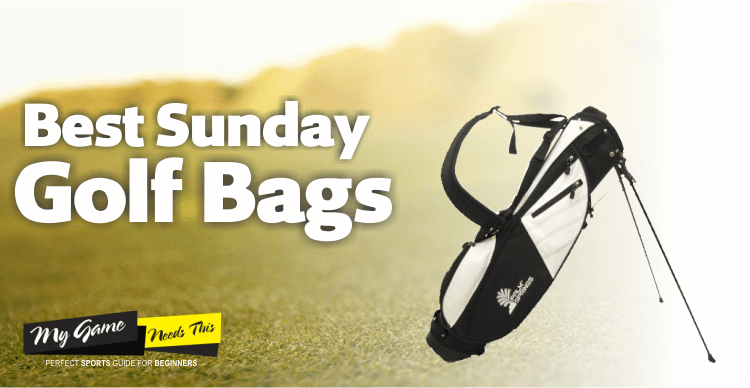 A well-known name in the Golf world, Palm Springs, however, it isn’t that pricy to buy them. In fact, they are extremely affordable. They can also be easily used in everyday life without looking out of place, because of the added spandex in the construction you will be able to feel confident while performing normal tasks. Crouching down in certain pants could be a scary experience but with Palm Springs you’ll be able to do so whilst making a Fashion Statement! Another great addition to our list of the Best Golf trousers, this time brought to us by Under Armour. They have managed to produce arguably the most comfortable pants on the market today, the soft fabric will ensure you remain comfortable throughout your session which can only be seen as a positive by Golfers. They have been made using 100% Polyester and a Soft, Stretchy, Woven Fabric which will not only be really soft on the skin but should also mean you will never have to iron the trousers no matter how many times you wear them! 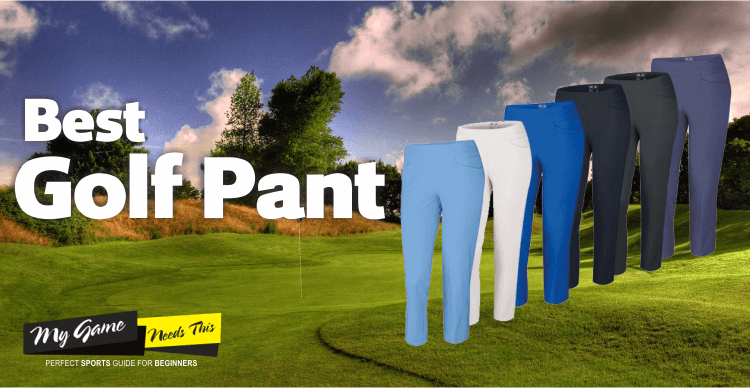 The one thing that everybody looks out for when purchasing pants for Golf is how good they are at keeping you cool, whilst ensuring no sweat or moisture builds up causing you any discomfort. Under Armour have done an amazing job of this using their Moisture transport system, this pretty much means the pants allow any moisture to be evaporated as quickly as possible. Who wants to play a long game of golf with sweaty trousers? Although they will need to be washed every now and then these trousers do a really good job of staying smell/odor free, Which means you can wear them for multiple games before they’ll need to be washed (They are also Machine Washable!). If you don’t want the usual colors Under Armour have made a wide range of different colors available. Under Armour are typically known for making high-quality hiking and camping gear, so it may be a surprise to some Golfers that they’ve decided to branch out into Gold Pants. However, they’ve done a great job and managed to make it into most critics top 5 lists! Customers have also been very impressed with them seeing as they’ve managed to gain an average rating of 4.3 out of 5 on the Amazon Marketplace! 95% Polyester and 5% Spandex which allows increased movement. Not the cheapest, but good quality. A classic look with a modern brand! The last one on our list, and definitely not the least! The Nike Golf Flat Front Pants are a great option for anybody looking for comfort, fit and quality. Whether this is because their club has banned shorts, or they simply need some new ones there are many reasons for you to take a second look at this pair. These Trousers comes with 95% Polyester material which makes it flexible yet durable, allowing the user to move around freely; without having to worry about them ripping off when checking the ground, looking for a ball etc! A really good product by Nike, buyers have hardly complained about any fitting issues, unlike some other brands. Nike are well known for producing Sportswear for everything from baseball to Soccer and they’ve done a very good job of creating some good Pants for Golfers, these will deliver a classic look while making sure you’re on top of the modern-day fashion trends. Nike has decided to use DryFit Technology to ensure that no sweat or other moisture will build up in the trousers throughout your game. 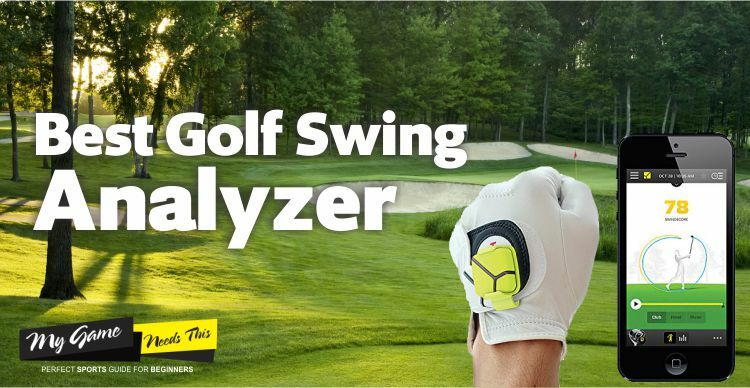 This should be something you’re looking out for when picking a pair of Pants for Golf as you will usually play on a nice Sunny day. Although these aren’t the cheapest & best winter golf trousers available you will be paying the little extra for guaranteed quality and a well-known brand. Most customers have loved these pants as they’ve gained an average rating of 4.6 out of 5 stars on Amazon (which is the highest out of all the Pants we’ve reviewed) enough to instill confidence in buyers about their good quality! Like most best waterproof Golf Pants you won’t have to wash these after every use as they shouldn’t keep a hold of all the odors. They are also really comfortable and come with a 30-day return policy, in case you find any problems related to the fit & quality of trousers.